None of this could have happened if a few folks hadn’t read those early posts and responded in a favorable way, encouraging me to keep writing and to take what started as a hobby and turn it into a career. I’ve lost touch with some of those early readers — my first commenter was “C” at Slakethirst, a long-defunct drink blog based in Portland, who astonished me not only with his helpful suggestions, but with the realization that somebody had actually *read* the stuff I was posting — but many others I still see or hear from via Facebook on at least a semi-regular basis. Gradually, as word got around that some lunatic was posting old drink recipes and commentary online (at least in those early years — this blog has grown a bit dusty with disuse), I was surprised to come across bartenders, distillers and other writers from around the world — as well as a vast number of civilians who simply enjoy a good drink — who had strayed across the Cocktail Chronicles, and stuck around to see what else I might do. Today I’m humbled and honored by the recognition I’ve received, and raise a glass in tribute to all who’ve encouraged me to keep going. Anyway, thanks, everybody — I appreciate all the support over the years that has made this ridiculous career of mine possible. Many, many congratulations and well deserved! 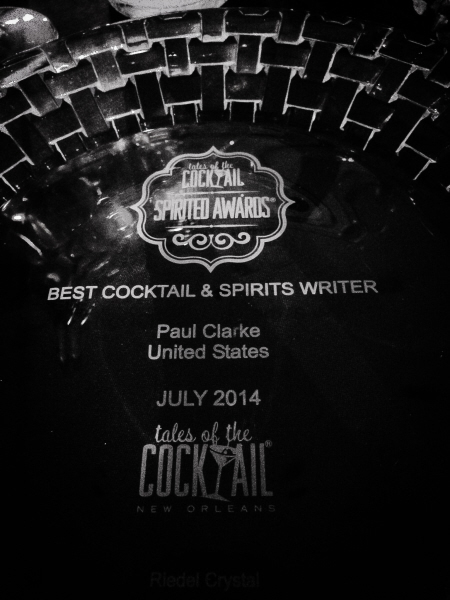 Congrats, Paul! It couldn’t happen to a nicer, more deserving guy and it’s a joy to see your success. More power to your elbow! Many congrats on both the award and your success! The Cocktail Chronicles was my guidebook when I first started seriously exploring good drinking 5 years ago, and is still a regular reference. Congratulations on your accolades, they are richly deserved! Fantastic news – it is intriguing to see you have this new project bubbling away… I am really impressed how you have made the crossover from amateur blogger to pro writer – it is a dream for so many of us. Keep up your outstanding work!